Fashion retailer\'s 1st in Mumbai, 8th in India. Splash has opened its first store in Mumbai at R City Mall, Ghatkopar reaching a count of eight stores in India. 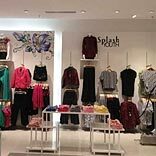 Spread over 10,000 sq.ft, the outlet stocks clothes and accessories under various categories and sections such as Splash Youth, Splash Smart, Splash DNM, Splash Formals, and Splash Accessories. International brands like Bossini, UCLA, Being Human, LP, US Polo Association, Smiley, and Free Authorities are also available in the store. Headquartered in Dubai, Splash is a part of the Landmark Group, one of the biggest retail conglomerates in the Middle East and India. Founded in 1993 as a single brand store in Sharjah, Splash now has over 150 stores and 50 brand stores across 12 countries.